University of Alaska Press, 9781602231733, 536pp. 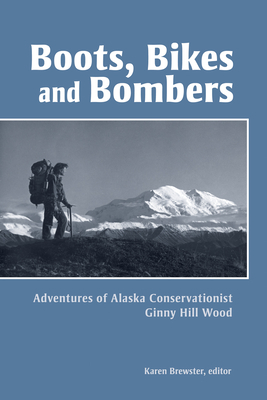 Boots, Bikes, and Bombers presents an intimate oral history of Ginny Hill Wood, a pioneering Alaska conservationist and outdoorswoman. Born in Washington in 1917, Wood served as a Women’s Airforce Service Pilot in World War II, and flew a military surplus airplane to Alaska in 1946. Settling in Fairbanks, she went on to co-found Camp Denali, Alaska’s first wilderness ecotourism lodge; helped start the Alaska Conservation Society, the state’s first environmental organization; and applied her love of the outdoors to her work as a backcountry guide and an advocate for trail construction and preservation. An innovative and collaborative life history, Boots, Bikes, and Bombers, incorporates the story of friendship between the author and subject. The resulting book is a valuable contribution to the history of Alaska as well as a testament to the joys of living a life full of passion and adventure. Karen Brewster is a research associate with the Oral History Program at the Elmer E. Rasmuson Library, University of Alaska Fairbanks. Her books include The Whales, They Give Themselves: Conversations with Harry Brower, Sr. and Boots, Bikes and Bombers: Adventures of Alaska Conservationist, Ginny Hill Wood, both from the University of Alaska Press.